The best memory foam mattress toppers are affordable and tremendously comfy to lie on for a good night sleeping like a log. There are some questions you are dying to get the answers for and we are here to help. Sometimes it is hard to ask a question if you don’t know what question to ask. That’s not double talk; it’s the truth and we will dispel your concerns with our descriptions, evaluations, and the best products in the marketplace today. We devote to sleeping, one-third of our lives. The other two-thirds will be better when we are up and about after sleeping on the perfect mattress topper that is restful to us providing us with the sleep we need to rejuvenate our body. You do not want to wake up with a sore aching back or a stiff neck where your pillows do not fit right anymore. You might need a mattress for the master bedroom, a child’s bedroom, or a guest room. Some are the right size for the dorm room, the camper, or a hospital bed at home. So, to feel renewed and energized when you get up, we hope our assessments for all your dreams come true. The first thing that might come to mind is, How do I know what to choose and look for? You might be wondering why you should use a memory foam mattress top, what types are available, what makes them so special, and then a listing of the best ones and why. Size—is very important. Do you want the topper to fit an existing mattress, or are you thinking of getting an entire new mattress set to add it to? Is it for a twin, twin XL standard or full, queen, king, or California king mattress? Be sure to make a drawing of your top mattress and measure each side carefully—even fractions if any, and also measure the bottom to top for mattress thickness, whether existing or new. Additionally, take measurements of the doors the mattress topper must fit through. Thickness—is the height of the topper. The typical thickness of toppers are 2-, 2-1/2-,3-, and 4-inch. Remember, a 4-inch thick topper will put your mattress 4-inches higher than it is. Each different thickness will give you different degrees of comfort and feel. Materials—the topper is made of should be hypoallergenic for allergy or asthma suffers, be able to guard against dust mites, and will not grow bacteria, or mold. You do want a number of resistant features within the materials. You will also do not want perspiration and oils from your body passing into the interior of the topper. Different Layers–provide different comfort levels for your sleeping pleasure. Firm toppers are for those who sleep mainly on their stomach and back for good support and comfort. Plush layers provide pressure point calmness and ease painful body areas that could cause pain and aching muscles from a more firm topper while sleeping. Tight tops have a flatter surface area that is manufactured with a stiffer fabric than the other types of toppers. Density—for each memory foam topper, there are considerations for compactness, bulk, thickness, or mass. The higher the density the better your body weight will be supported and pressure points lessened. You will want to determine if temperature is controlled so you will not be too hot sleeping. The foam in 3-pound density is more common, whereas 4-pound density is used by those who have chronic back, head, neck, and joint pain. Denisty is measured in cubic inches. A 3-density will be 3 pounds of density per cubic inch. Warranties and Guarantees—You want to watch for extended Warranties and have a customer service phone or email to contact if you have any problems. We use memory foam mattress toppers when we have a perfectly good mattress and do not want to go to the expense of buying a new mattress set—we only want an added topper. You can get a good night’s rest when you are not sleeping comfortably on your mattress as it is or if you have aches and pains. Simply, add a topper to your mattress that will give you more support, lessen pressure point pain and are so comfy. Support: Mattress toppers mold to your body totally to give you better support. Memory foam mattress pads are ordinarily good for all sleepers—back, stomach, and side. Less Expensive: It’s cheaper to buy a topper than it is to buy a new mattress set. However, when your existing mattress becomes old and is no longer providing support and comfort, it’s probably wiser to purchase new mattresses. Added Comfort: A mattress topper added to your existing mattress will feel softer with the added level of a top-quality best memory foam topper. Liberation: You will experience a good night’s restful sleep without having your pressure points being affected. This will eliminate that situation with a mattress topper to get rid of those and any other pains, soreness, and aches because of a plain mattress. To liberate yourself from a tossing and turning night of trying to get good sleep, a mattress topper will improve your sleeping night. Why is Memory Foam so Special? Memory foam was first designed by NASA (National Aeronautics and Space Administration) in the 1970s as crash protection for airplane pilots and passengers. It is also known as temper foam. It is now trendy for mattresses, mattress toppers, and pillows. Made from viscoelastic, it is soft and absorbs energy. This first made its appearance in the mid-1990s designed to fit your body when you are sleeping. It reduces stress on joints and improves blood circulation. This foam material is anti-microbial so you will have no dust mites and allergens. It is not the same as the traditional foam in that it has a gel that is also used in sports shoes. This provides a better support hugging your body’s pressure points and joints. When you have bad posture while sleeping and hurt with pain and aching, this provides just what you need. You will receive a Warranty that is better with this type because it is more heavy-duty than traditional foam. Gel foam feels more firm due to its density than the traditional foam if you prefer firm. A typical criticism for memory foam is that it can create heat from your body. Air-cooled memory foam is now available to send the warmness out of the material providing you with a cooler sleep. There are models that have open cell technology to detect your body heat and distribute it evenly. This foam is very soft with great support for your body. Please read our evaluations of the best memory foam toppers to help you with your selection for a good night’s restful sleep. Are you tired from sleeping on a lumpy bumpy mattress? 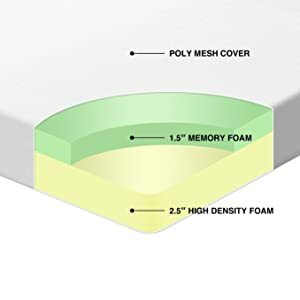 Memory Foam Solutions offers its 3-inch thick viscoelastic with 4-pound density memory foam mattress pad bed topper for luxurious comfort relieving pressure points. It is available in California king, king, queen, full, twin extra-large, and twin, made in the USA with its gel-like material. This memory foam mattress pad is good for all sleepers—back, stomach, and side. If your current mattress is sagging, this is a perfect fix for immediately having it be more comfortable and supportive for a good night’s rest. It complies with the PURGreen Certification standards meaning the mattress is constructed and packaged to meet all EPA (Environmental Protection Agency), CSPC (Consumer Product Safety Commission), and ISO (International Organization for Standardization) regulations in the USA, and free from unhealthy toxins. No ozone-depleting chemicals, for instance formaldehyde, prohibited phalates, polybrominated diphenyl ether, or chlorofluorocarbons, are used in the manufacturing process. This topper is ranked #1 at Amazon in Home and Kitchen, Bedding, and Mattress Toppers category. The topper will need to have a protective zippered mattress cover and bed sheet, easy to attach. If you want a mattress heater, be sure to put it between blankets or a duvet, or comforter, but not directly on the foam. Your body will generate heat. Try an electric blanket for additional warmth. Gift-wrapping is available with instructions and a 3-year Limited Warranty on memory foam toppers covering the average lifetime of the topper. 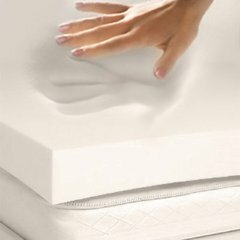 The Sleep Joy® manufactured by Sleep Studio® offers its 2-inch thick ViscO2 topper in king, California king, queen, full, twin extra-large, and twin, made in the USA. The material breathes with its ventilation open cells to provide a healthy sleep setting to keep you cool when asleep. The topper is made with plant-based components and has no odor. You will have a dreamy night’s sleep being cuddled for comfort and pressure point relief. Spot clean only, do not machine wash, or dry. The topper will need to have a protective zippered mattress cover and bed sheet, easy to attach. Gift-wrapping is available with instructions and a 2-year Limited Warranty. Fed up with that old lumpy uncomfortable mattress? Put new life into it with the 2-1/2-inch LUCID® gel-Infused ventilated mattress topper of latex foam that will give you a good night’s rest to sleep like a baby. The LUCID® gel is permeated with gel beads to provide you with a cool sleeping experience. The sizes available are king, California king, queen, full, twin extra-large, and twin, made in China. Capturing heat permits the air to flow and will modulate your sleeping temperature for coolness and feeling comfy. The bread dough texture will correspond to your body’s weight and pressure. If you suffer from neck and shoulder pain, this topper should alleviate that by aligning your spine to support its natural curvature. The topper is hypoallergenic for allergy and asthma sufferers, and resists dust mites and insects. The zippered bamboo cover is removable, and can be washed and put in the dryer on low heat as the instructions state. Gift-wrapping is available with instructions and a 3-year Limited Warranty. The Sleep Joy® manufactured by Sleep Studio® offers its 3-inch thick ViscO2 topper in king, California king, queen, full, twin extra-large, and twin, made in the USA. The material breathes with its ventilation open cells to provide a healthy environment to keep you cool when asleep. The topper is made with plant-based components and has no odor. You will have a dreamy night’s sleep being cuddled for comfort and pressure point relief. 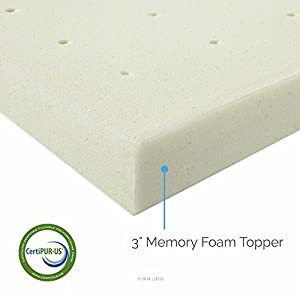 The LUCID® 3-inch ventilated topper with 3-inches density premium memory latex foam mattress topper has holes for maximum airflow allowing any moisture vapor to be transmitted from the foam pad. Pressure point assistance is provided for first-class comfortable sleeping and sweet dreams. The sizes offered are king, California king, queen, full, twin, extra-large, and twin, made in China. Body imprints will not stay with the technically complex engineering and design using the open cells. The topper is resistant to dust mites and allergens for asthma and allergy sufferers. Your spine will be aligned with the texture of the topper relieving shoulder, back, and neck pain. It aids those suffering with fibromyalgia and scoliosis. Your entire body will be comfortably and healthfully supported. It does not come with a cover so it would be advised to put it into a zippered cover that is not plastic and cover with a fitted sheet. The supportive and comfortable 2-inch thick MILLIARD™ comes with an over-the-top mattress topper cover that is super soft, removable for cleaning, and will not slip. The topper sizes are offered in twin, full, queen, and king. You will sleep well with this anti-microbial and hypoallergenic foam mattress topper that will benefit asthma and allergy sleepers. There will be no dust mites, bed bugs, or insects to deal with. The blue side is the memory foam material, while the white side is the bamboo cover that fits tightly to zip shut. Put on a mattress pad, a fitted sheet, and you’re ready for sleep. The gel memory foam will ease neck, back, shoulder, and sciatic nerve pain, joint pain and arthritis pain conforming to your body aligning your spine whether you sleep on your back, side, or stomach. The topper will not lose its shape, maintains temperature for a good night’s sleep, and provides superior airflow. There is no need to spend thousands of dollars on a new mattress. This topper will make your old mattress feel new again. Gift-wrapping is available with instructions and MILLIARD Bedding™ offers 30-days from purchase date for returns. The topper is made in China. 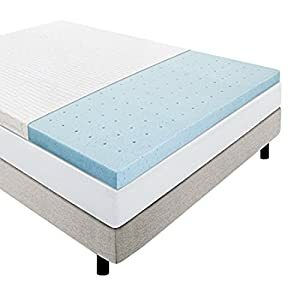 Best Price Mattress 4-Inch memory foam mattress topper has 1-1/2-inches of memory foam on the top and 2-1/2 inches on the bottom for a total of 4-inches. The topper is wonderful over an existing mattress that will support your body evenly and adjusts to your temperature for a good night’s sleep for stress-free support. The topper comes with a polyester mesh zippered cover. The mattress topper is sized 1-inches shorter on all four sides of a standard-sized mattress. It is made to use your existing sheets that will be tight and snug. It’s best to measure your mattress to be sure you’re ordering the right size to go on top. The toppers are CertiPUR US Certified. The CertiPUR-US program is a voluntary test for certified flexible polyurethane foams. The foam is viscoelastic and is more porous than closed cell foam for comfort to you and breathability of the topper. It is high-density foam and the open cells self-ventilate to keep your body temperature cool. It is resistant to mold, bacteria, dust mites, bed bugs, and hypoallergenic for allergy and asthma sufferers. You will not disturb the person you sleep with because the foam separates movement. Each of you will not know when the other person turns over. Experience a more restful sleep waking refreshed. Gift-wrapping is available with instructions and a 5-year Warranty. The topper is made in China. Sleep Innovations™, parent company Innocor®, has been creating sleep products for over 20 years. 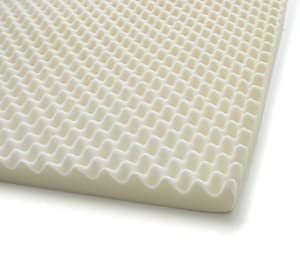 Parent company, Innocor®, has been producing foam products for over 60 years. The dual layer mattress topper is made of gel memory foam and plush fiber. The sizes offered are twin, full, queen, king, and California king for a relaxing and restful deep sleep on the topper, made in the USA. When you want to feel like you are sleeping on a cloud, this matchless topper will provide that. You will have an additional layer-fill in the soft quilted cover of 2-inches of memory foam that is cool to your body with the SureTemp™ memory foam toppers. Your circulation will improve and pressure points find relief while helping you with back, neck, and shoulder aches and pains. This high-end 2-layer design is a supportive therapeutic topper and is a leading brand being affordable. 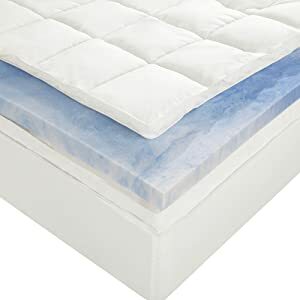 The topper arrives in two pieces; the blue cooling gel memory foam topper pad that covers your mattress holding the top white quilted cover in place that goes on top. The 100% cotton fitted cover is 300-thread count, stretches, and is removable and can go into the washer and dryer. Use deep pocket fitted sheets to cover it, and you will enjoy the topper staying in place. The foam piece can be washed in the shower and hung up to dry. Do not put the foam in the dryer! Gift-wrapping is available with instructions and a 10-year Warranty. Carpenter Company® created SleepBetter™ and has been producing top quality products since 1948. The SleepBetter™ 3-inch viscoelastic memory foam mattress topper will give you the comfort you want for a good night’s sleep. The therapeutic topper is made proudly in the USA. Carpenter Company is the world’s largest maker of polyurethane foam and the leading processor of polyester fiber for the bedding industry. The toppers are CertiPUR US Certified. The CertiPUR-US program is a voluntary test for certified flexible polyurethane foams. 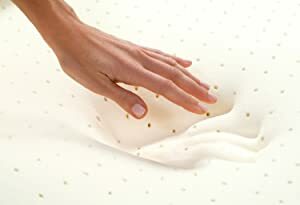 The mattress topper will lessen tossing and turning and you will never know you partner is turning with this viscoelastic foam that will relieve pressure point pain, back pain, neck and shoulder aches and knots. It is available in twin XL, queen, king, and California king. Your body will be hugged by the topper for a comfortable sleep. The open-cell foam allows air circulation that will breathe to keep your body cool while you sleep. It has 2-1/5-inches per cubic foot density and is hypoallergenic for asthma and allergy sufferers. Spot clean as stated in the instructions to keep fresh and clean. A cover does not come with the topper; however, a mattress pad and fitted sheet will work well. The topper is great for back, side, and stomach sleepers and is used in hospitals. It is wonderful contouring to the body of pregnant women to support and comfort them. The elderly benefit greatly for their specific pains, aches, and pressure point pain. It benefits the bed-confined and is frequently used in hospitals. It is also great for pregnant women, the elderly, and anyone who needs a good night’s rest. Spot cleaning with warm water and a mild detergent will remove most stains. Instructions for care are included with a 5-year Warranty. The supportive and comfortable 2-inch thick MILLIARD™ comes with an over-the-top mattress topper cover that is super soft, removable for cleaning, and will not slip. The topper sizes are offered in twin, full, queen, and king. You will sleep well with this anti-microbial and hypoallergenic foam mattress topper that will benefit asthma and allergy sleepers. 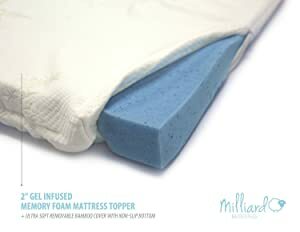 The foam mattress topper has 65% cotton waterproof non-slipping cover that is removable for cleaning only available at the MILLIARD™ website. You can cover it with a fitted mattress for keeping the topper clean and fresh. The topper’s 3-inch per cubic foot density foam is anti-microbial to eliminate dust mites, bed bugs, bacteria, and mold. The complex egg crate pattern affords better air circulation around your body. The open cells contain pores that confine air to the inside, and the compressed air spreads to the neighboring cells increasing airflow distributing body heat regulating your body temperature. To relieve back, shoulder, and neck pain or aches, and to minimize painful pressure points, the MILLIARD™ topper also helps sciatica, fibromyalgia, and arthritis pain. You will enjoy less turning and tossing about when lying comfortably on the great topper that aligns your spine with no pressure. It will not lose its shape always conforming to your body shape. SAFETY: Urethane Foam is flammable! Do not expose this product to open flames or any other direct or indirect high temperature ignition sources such as burning operations, welding, burning cigarettes, space heaters, wood burning fireplaces, or naked lights. Once ignited, urethane foam will burn rapidly, releasing great heat and consuming oxygen at a high rate. In an enclosed space, the resulting deficiency of oxygen will present a danger of suffocation to occupants. Hazardous gases released by the burning urethane can be incapacitating or fatal to human beings if inhaled in sufficient quantities. Cleaning and maintaining a memory foam mattress topper is easier to do than a full mattress. It is lightweight and easy to manipulate. Depending on the surface texture there are a few easy methods, and always follow the manufacturer’s instructions for best results. Shake baking soda over the top surface for an hour, then vacuum it off. If your surface is not flat, vacuuming might be a challenge. This will also remove pet hair, dander, and lint. Some toppers can only be spot cleaned. Some can be wet entirely in the shower or tub and then left to hang-dry. Cleaning can be accomplished with a mild dish detergent and warm water then rinse clear of water and hang to dry. Most toppers cannot go into a washing machine and dryer. Read your instructions that came with your topper. There are many mattress toppers in the marketplace today. Be sure to do plenty of research and read reviews. We have chosen the best toppers to help you in your search. You can find great deals on Amazon, and everyone loves discounts and deals. The information presented here will give you things to look for and provide you with an understanding about the best memory foam mattress toppers. Shop wisely to enjoy a comfortable good night’s sleep with pleasant dreams.